A hero stone (Viragallu in Kannada, naṭukal in Tamil) is a memorial commemorating the honorable death of a hero in battle. Erected between the 3rd century BC and the 18th century AD, hero stones are found all over India. They often carry inscriptions displaying a variety of adornments, including bas relief panels, frieze, and figures on carved stone. Usually they are in the form of a stone monument and may have an inscription at the bottom with a narrative of the battle. According to the historian Upinder Singh, the largest concentration of such memorial stones is found in the Indian state of Karnataka. About two thousand six hundred and fifty hero stones, the earliest dated to the 5th century have been discovered in Karnataka. The custom of erecting memorial stones dates back to the Iron Age (1000 BCE–600BCE) though a vast majority were erected between the 5th and 13th centuries AD. A hero stone was usually divided into three panels, but occasionally, into four or five panels depending on the event. The upper panel depicts the subject worshiping a deity such as a Shiva linga, the middle panel depicts the hero sometimes seated in a palanquin or a shrine being lifted toward the heavens by apsaras (heavenly nymphs), and the lower panels would display battle scenes One of the largest Viragallu, about 12 feet high is found in Betageri, Karnataka. In Tamil Nadu Department of Archeology found several hundred hero stones that had been erected in the memory of warriors who sacrificed their lives defending their community or region. Those that are carved with inscriptions narrate the act of the hero, the battle, and the name of king who fought the battle. The stones are found alone or in groups, often near an irrigation tank or lake outside a village. 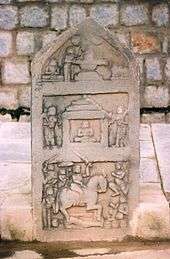 One hero stone dating to the 9th century Pallava King Dantivarman, depicts the hero riding a galloping horse beautifully dressed and carrying a spear. Another was recovered at Pappapatti in Usilampatti taluk and probably dates from the 18th century. This stone shows a warrior posed heroically, accompanied by his wife who holds a flower. Creating hero stones had been prevalent since the Sangam period dating back 2300 years, and continuing until the Nayaka and post-Nayaka period to about 1800 A.D. In March 2014, a hero stone dating to the 8th century Pandya country, with an inscription in Tamil vatteluttu script was found in Vellalankottai in the Tuticorin district. and another that was installed by a woman in memory of her husband who killed a leopard preying in cattle that strayed into the hamlet. Hero stones were not always made in honor of a person(s). The Atakur inscription (also spelt Athakur) is one such hero stone. It is dated to 939 A.D. and includes classical Kannada poetic inscription commemorating the death of the favorite hound of Ganga King Butuga II (the hound died fighting a wild boar). ↑ Filliozat, Jean (1991). Religion, Philosophy, Yoga: A Selection of Articles. Motilal Banarsidass Publ. p. 151. ↑ "Hero-stone Memorials of India". Kamat Potpourri. Retrieved 2007-03-15. 1 2 T. S. Subramanian (March 30, 2014). "Hero-stone discovered in Tamil Nadu". ↑ "Dolmens, Hero Stones and the Dravidian People". Retrieved 2009-06-30. ↑ "Pallava period 'herostone' unearthed in Vellore dt.". Retrieved 2007-03-15. ↑ "2,300-year-old hero stones found in Theni district". Chennai, India: The Hindu. 2006-04-05. Retrieved 2008-05-14. ↑ "'Hero stone' unearthed". The Hindu. Chennai, India. 2006-07-22. Retrieved 2007-03-17. ↑ "A hero stone tells a tale from eighth century". The Hindu. Chennai, India. 2006-07-22. Retrieved 2014-10-13. Singh, Upinder. A History of Ancient and Early Medieval India:From the Stone Age to the 12th Century. India: Pearsons Education. ISBN 978-81-317-1120-0. Wikimedia Commons has media related to Hero stones. Pallava period 'herostone' unearthed in Vellore dt.